Asia/Pacific. 8.1% or $286 billion growth. Reason: better financial inclusion. Latin America. 7.6% or $83 billion growth. Reason: Brazil’s recovery. Middle East and Africa. 7.6% or $49 billion growth. Reason: better financial inclusion. Eastern Europe. 5.1% or 15 billion growth. Reason: fast modernization. North America. 2.8% or $100 billion growth. Reason: increasing interest to investments. Western Europe. 2.2% or $40 billion growth. Reason: unfavorable regulations. However, such figures hide less prominent facts. Banks spend huge parts of their funds on legacy systems which can’t fulfill the needs of modern customers. Financial facilities which rely on in-house workers exclusively perform worse than their opponents which distribute processes. 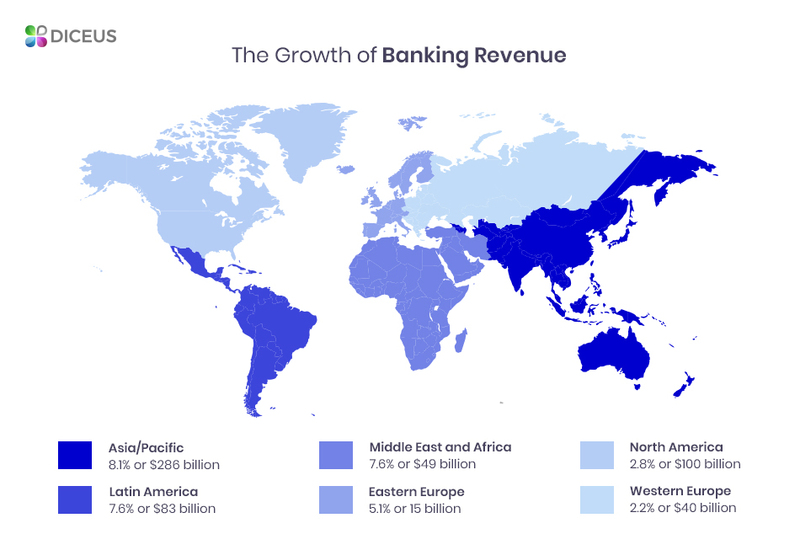 Thus, the overall idea of IT outsourcing banking industry becomes more popular as enterprises can pass on routine tech projects and work on critical missions. Consider also the growing interest to personalization and innovations which forces banks to implement modern CRM systems, digitize various stuff, and pay more attention to every client. Hence, diversifying and delegating may result in significantly higher results related to revenue or reputation. Let’s find out how IT outsourcing services are useful and which bank outsourcing trends emerge now. Traditional banking systems are closed and highly secure because they keep all processes and data inside their unique ecosystems. But the rising difficulty of technologies and higher clients’ demands reshape this world and change approaches to doing business. Faults of IT departments become more crucial now because banks can’t afford to lose trustworthiness and, respectively, profits. Even governments realize this – just remember the IT meltdown in RBS and subsequent £56 million fine from the UK. Expansion. Increasing the size of IT-related teams may be expensive but with third-party partners, you don’t have to invest in it. Modernization. Outsourcers take care about improving your current systems by purchasing new hardware and integrating modern software tools. Turnover. Obviously, outsourcing companies pay their employees, so you can save money on hiring and training staff. Issues. Various tech problems may lead to insane expenses but professional support teams are qualified enough to fix bugs and support platforms. IT departments are no longer indispensable. Moreover, outsource companies are even better than banks’ IT teams in terms of basic formal work like hosting or supporting. There’s a popular idea that third-party corporations don’t care about their clients’ sensitive info and can’t the required protection. But the given market is built on ideas of trust and mutual responsibility. Usually, outsourcers sign contracts according to which they lose 100% of revenue during hard periods when they don’t meet the stated requirements. Our company shares this vision and delivers fully-custom products for different industries like bank outsourcing services. We care about all stages and follow client’s needs strictly to get the best results. We’d suggest delegating certain tasks to our team but the exact list of them depends on your bank’s objectives, wishes, and possibilities. If you want to know what type of tasks usually do bank outsource to us you can check it on the dedicated page. Long story short, banks can leverage nearly everything from mailing campaigns to payment processing. But IT tasks come to the fore now as they provide for digital processes. Without a proper in-house IT department or trusted outside partner, your company have little chance to survive and attract customers. Thus, check basic tools from IT outsourcing bank industry: administration, databases, data import, hosting, security, and support. Digital transformations. Banks actively migrate to the digital universe where they can meet new customers’ demands. IT companies serve as partners as they create and support online/digital versions of mailing campaigns, accounting tools, reports, HR management platforms, and so on. Omnichannel solutions. Modern customers require more personalized and streamlined access to banks’ services. IT outsourcers can handle migration to omnichannel platforms which provide for easy access from any device. Simultaneously, such platforms facilitate data gathering and analyzing, so financial institutions can improve customers’ experience. Blockchain tech. Innovations rapidly change industries and blockchain/crypto stuff highly relates to finance sector. While banks may face difficulties with decentralized platforms, experienced IT teams are ready to implement them. Thanks to blockchain-based storages and networks, your company can deliver and protect data much more efficiently. CRM. Banks rely on their customers’ loyalty a lot. This means that specific systems for attracting, retaining, and pleasing clients are vital for any bank which wants to grow. CRM platforms are considered as totally in-house tools because they keep sensitive info. Still, you can pass this task on. The partner will be responsible for interacting with clients and your team will be able to focus on development. BI and analytics. To deliver perfect services, financial companies have to study clients and learn their wishes. Business intelligence and analytical departments gather big data, create comprehensive reports and suggest required changes. Surely, they can handle these changes which are usually related to innovations. Finally, it’s possible to hand over core things like transactions or maintaining ATMs’ networks. For this, you will need the perfect partner which has a great reputation and enough power to handle these key processes. 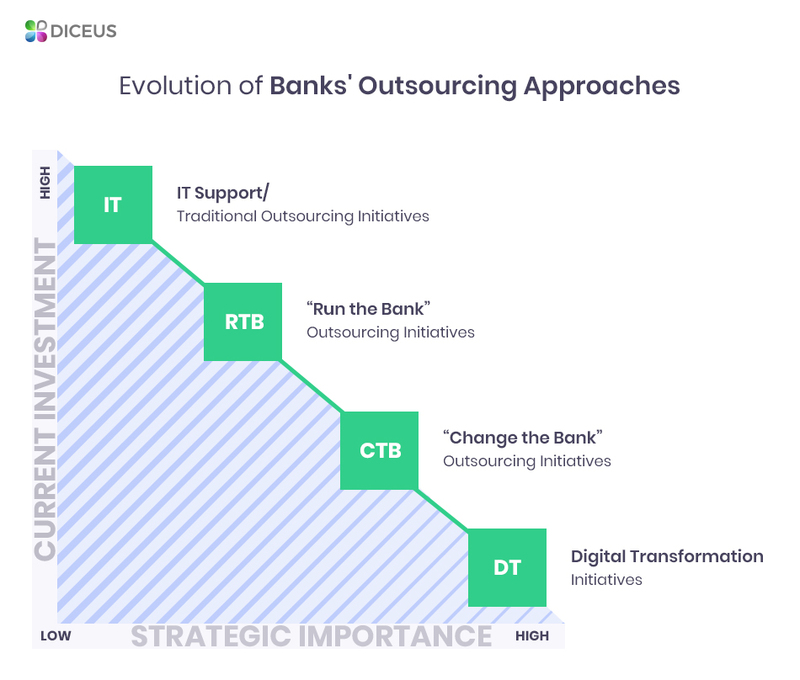 Still, we think that the idea behind IT outsourcing banking industry is about delegating minor tasks to free up native employees and allow them focusing on more creative things. Remember also to avoid outsourcing works which are unique for your bank or highly linked with internal stuff. The world’s leading consulting agencies have published their insights on the progress in various industries. Particularly, Deloitte and Elixirr issue new versions of their reports dedicated to banks and finance. 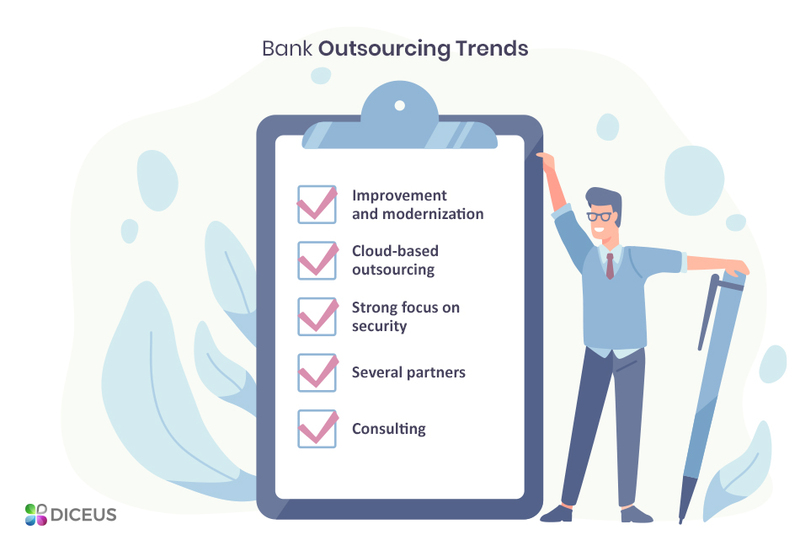 Here are the five most important bank outsourcing trends for 2019 and further. Improvement and modernization. 29% of surveyed companies plan to use IT for improving accessibility for workers and customers. 23% of them plan to modernize legacy systems. Cloud-based outsourcing. Online storages and powers are highly convenient and more efficient. Cloud services allow outsourcers to cut costs even better and provide better performance. Strong focus on security. With the migration to clouds, companies care about cybersecurity. Hence, this sector is prevailing in various bank outsourcing projects and investments. Several partners. The growing sophistication of industries disrupts traditional all-in-one companies. More players appear to handle unique needs, so we can expect banks to partner with various teams. Consulting. Finally, new technologies and methodologies such as DevOps, Agile, and blockchain capture the minds of traditional financial corporations. They seek knowledgeable teams to learn about innovations. Read about the Eastern Europe market to learn more about rising talents. However, the most global trend relates to the nature of outsourcing. Since the 1990s, banks leverage tech stuff to outer companies to cut costs and free resources but modern markets introduce new approaches. For example, increased regulations, technology progress, and higher customer demands lead to run-the-bank and change-the-bank strategies according to which financial facilities outsource even core and back-office processes like due-diligence systems, mortgages, risk management, HR tasks, and marketing. Modern banks have to be agile by focusing on clients and predicting their needs. Currently, the age of digital transformation begins while outsourcing partners use BI and analytics to evaluate banks’ performances, new technologies, and consumers’ engagement levels. As well, outer firms apply innovative tech to create and support modern mobile and cloud solutions for banks. As we know both current situation and predicted tendencies of the IT outsourcing banking industry, it’s time to ask: do we really need third-party partners to entrust them some services? 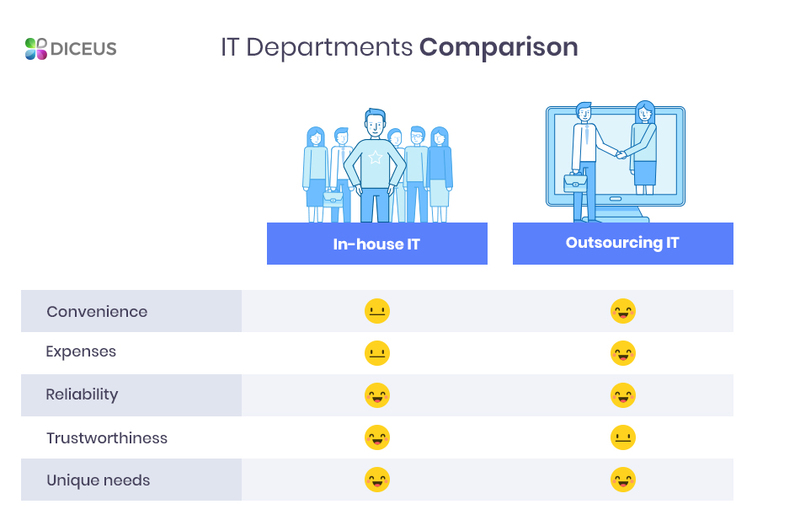 Probably, own IT teams are better? The main advantage of own solutions is their reliability and uniqueness. Means, in-house IT department consists of trained employees who know the features of your bank and focus on its needs exclusively. In addition, you don’t have to share key information with other parties because all processes are inside the bank’s ecosystem. However, remember about higher labor, security, and maintenance costs, as well as need in proper HR department to hire and train your IT-related experts. On the other hand, bank outsourcing services are convenient as you can pass on daily tasks to the already formed team of professionals. Usually, these IT geeks are more skilled than your employees, so they can provide efficient expertise, save your time and money, and even deliver unique business analysis. By cooperating with companies which focus on clients’ needs, you get literally the same team but located outside. As for security issues, outsourcers also care about their reputation and don’t want to fail. Convenience: outside partners free your employees from routine. Expenses: similarly, outsourcers are more profitable. Reliability: both ways are reliable if you work with professionals. Trustworthiness: in-house workers are easier to control. Unique needs: again, in both cases, you get a personalized approach. Save money. With outsourced IT department, you can cut expenses related to in-house employees and hardware/software maintenance. Improve security. Outer teams, usually, are skilled enough to provide for great cybersecurity. Thus, you can protect key data easily. Focus on core tasks. A lot of banks hire IT outsourcers to hand over daily tasks. In this case, your own experts will be able to concentrate on strategic points. Attract customers. Overall, improved security and more attention to core processes lead to better reputation and personalized engagement programs. Keep in mind also that financial institutions can pass on more activities, not only IT-related. Thus, banks can get even more benefits because they free more time to focus on creative tasks and cut costs. Define the company’s needs. Choose which processes you want to pass on and which will remain unchanged. Generally, managers keep core strategic initiatives in-house while they delegate daily IT operations. Secure an SLA. In other words, it’s Service Level Agreement. This paper specifies how and when the chosen outsourcer will maintain processes, how it will react to emergency cases, and so on. SLA should clarify everything. Foresee potential expenses. Outsourcing lets you move from CAPEX to OPEX. The latter costs are more flexible and can be easily represented in SLA. However, don’t forget about force majeure. Know your laws. To avoid miscommunications and customers’ complaints, study local regulations properly. Thus, you will know how to work with identifiable information and clients’ statistics. Ensure in the partner. Security is vital in the IT outsourcing banking industry. Be sure to cooperate with reputable companies only, obviously. And here’s the most important step of our guide. We realize how banks risk when decide to share their in-house data with other companies. That’s why we think that proper research of the market and available outsourcing teams is crucial. In our company, we provide the necessary guarantees and sign key contracts, so don’t worry about possible pitfalls and issues. Data warehouses: we have created architecture and design of databases with end-to-end workflows, ERL data acquisition, general ledgers, COTS-MIS systems, data adapters, and business rules. These apps are successfully implemented and currently supported. Online banking solutions: we have delivered mobile applications with wallets, live updates, and social network integrations, and web services with modules for clients’ info, documents, loans, deposits, currency exchange etc. FinTech soft: we have designed and integrated managerial systems with automated reporting tools, stand-alone and SaaS applications for accounting, analytics, and visualization of financial data for employees and users. Contact now to learn more about our bank outsourcing services and get our specialist’s consultation immediately.